For more than a decade, Advanced Roller Co. has been an industry leader, providing fast and efficient service to companies large and small. Headquartered in Corona, CA, the family owned and operated business makes customer service a top priority. We stock rollers for Letterpresses. We also manufacture all rollers for the printing press industry. Our extensive inventory allows us to offer replacement parts that ship in as little as two days, without costly rush charges. In addition to replacing and supplying parts for large print rollers, Advanced Roller Co. also serves existing equipment and offers expert assistance in new system set-ups. With a large client base in the United States, Advanced Roller clientele also includes companies abroad. When the warn rubber roller arrives in our shop, the procedure is to strip the old rubber off the metal core. We recover the roller with new rubber according to the customer’s request. We then bake the roller in our autoclave, which is on site. After the baking process the rollers are put on grinders and grinded to proper specs. They are wrapped and shipped back to the customer or delivered personally by one of our drivers. Turnaround time is usually 1 day. Advanced Roller Company takes pride in being a manufacturer of superior quality roller products for the graphics industry. Our products are made on site, from start to finish. Our new, state-of-the-art autoclave for cooking rubber rollers is just one indicator of our dedication to quality and performance. 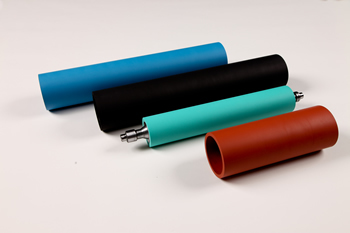 Tinting Sleeves are among our most popular items. Our services include Journal Repair, Machine & Welded Shaft Repair, and chrome roller cores and refurbished or new printing press rollers.